I have been out and about enjoying the nice weather, taking lots of photos. I love the sense of renewal that comes with Spring! I have also been hard at work in my studio painting a new piece which features a portal and an abstract bird. I will post it in a couple of days or so. This video shows spectacular images of Gaia, our Mother Earth . . . So beautiful and so fragile . . .
Last night I had the strangest dream! I dreamed that I was watching trees walk out of the ocean onto land. They walked in small groups, communicating with each other by waving their branches back and forth. The sky was orange with red and gold light playing across he landscape. The dream was very magical and I felt so happy and free. It was at that moment I realized I was a tree too. After writing my dream down I got up and grabbed a cup of coffee. 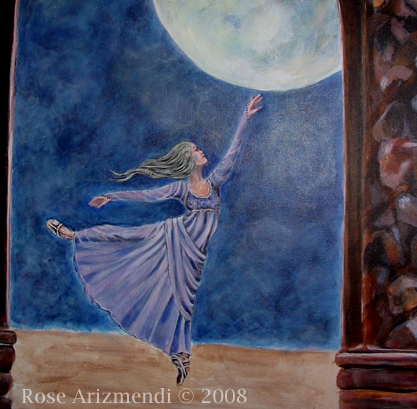 Then I decided to make a painting of my dream. Even as a child I have always had unusual dreams, which include a great deal of detail, and I always dream in full technicolor, with all five senses engaged. For more info on dreams and dream cards go here. 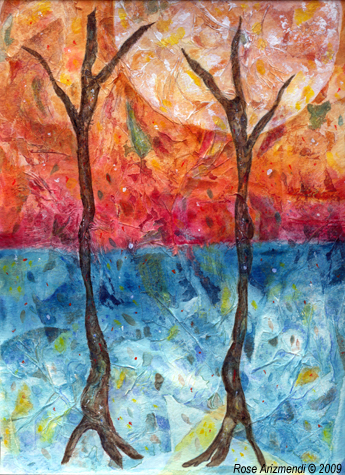 When Trees Walked the Earth – Acrylic Art – Mixed Media Collage – 9 x 12 inches on paper. Today I woke up to another gray, rainy day and I really didn’t feel much like doing anything so I grabbed a cup of good strong Irish tea and began my day. 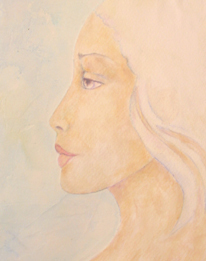 Later in the afternoon, I was able to work in the studio and started laying in the background colors on this painting. I also did some touch ups and added more details to the hair section. I did not get as much done as I had planned on because daylight was fading fast and it was already time to start dinner. I turned off the studio lights and said goodnight to the Tree Guardian. During this time of the year, the focus is on new beginnings, new projects, manifesting dreams, and I was thinking about what the future holds for us and future generations. Well, after reading the news this morning I decided it was time to stop and smell the roses so I turned off the computer and headed out to the studio. I pulled out a sheet of watercolor paper and began to sketch a portrait of my sister which then morphed into something completely different. 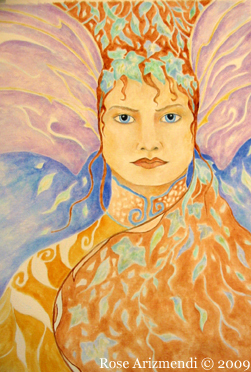 I began to hear my muse whispering in my ear of ancient forests, beautiful winged beings, swirling colors of blues, russet and subtle shades of green sprinkled with lavender. What’s a woman to do? Go with the flow, of course! 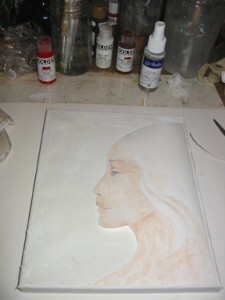 Below is a photo of the painting in it’s first stages. “If you sit still long enough on the forest floor, the universe will approach you like a shy animal. Breathe softly and don’t move: If encouraged it will nuzzle your open hand. 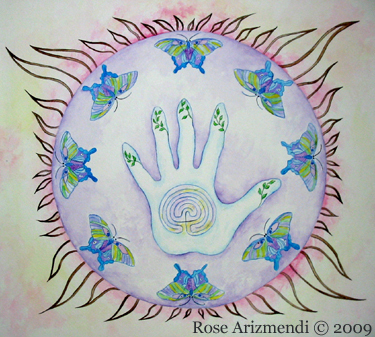 This weekend I started working on the “healing labyrinth mandala” painting below. It was inspired by the mandala exercises I’ve been doing from “The Mandala Healing Kit”, by Judith Cornell, Ph.D.
After doing the exercises in the workbook, I decided to make a mandala on watercolor paper using acrylics, watercolor and ink. This is a work in progress so I will keep you updated. For me, the mandala is a symbol for healing, growth and transformation. I spent most of the day finishing yesterdays journal and then started a new one. I was having so much fun that before I knew it, the sun was setting. Now, I have just enough time to take a nice warm bath, slip into my pajamas and watch a movie with my husband. Sounds like a perfect ending for a busy Friday. 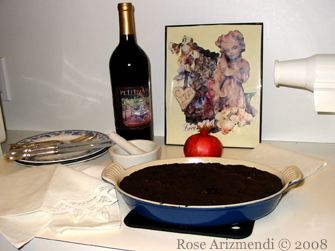 I also baked a Chocolate Truffle dessert for later. Yum! Wow! The Acrylic and alcohol video below is awesome! I dream a lot. I do more painting when I’m not painting. It’s in the subconscious. 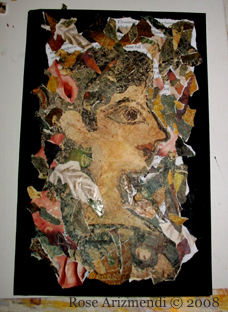 It’s another day in the studio and I am working on a new collage/painting. 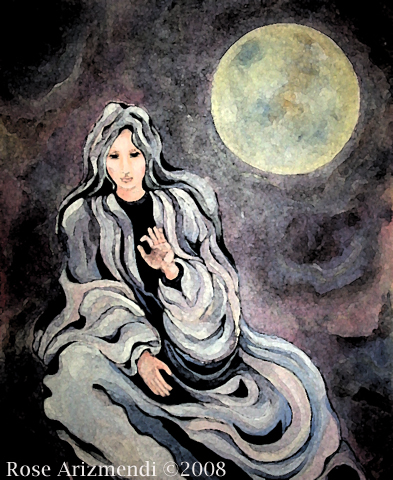 For the theme of this painting I chose the I Ching hexagram Tui which represents happiness, joy, success, and good fortune. The trigram Tui also denotes the youngest daughter and is symbolized by the smiling lake which is associated with freshwater in low areas: rivers, lakes, and marshes. I began by prepping the canvas and then sketched the face below to represent the young daughter then glued the face, Tui symbol and the moon to the canvas. I decided on a palette of cobalt blue, turquoise, primary cyan, and burnt umber, mostly trying to stay with yin colors which are said to bring about healing and relaxation. Whew! This is what I have done so far. Tomorrow I will take a fresh look at what I’ve done so far and begin fine tuning it. What a beautiful morning! The sun is out … the air is crisp, and from my studio window I watch people hurrying along the sidewalk, listening to the sound of fallen leaves crunching beneath their feet. With coffee cup in hand I begin prepping canvases by laying down a coat of gesso. While the canvases dry I make some preliminary sketches then choose the ones I want to use and transfer these to watercolor paper. I cut out the selected images and apply a light coat of gesso to the back of the watercolor paper and leave it to dry. When the canvases have dried completely I apply either Golden ( soft or hard) molding paste with a large painting knife and put these aside to dry. This gives the canvas the look of aged plaster. 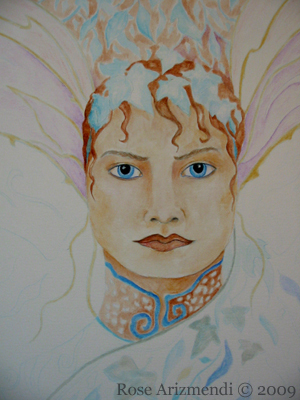 At this stage I may choose to apply the individual watercolor collage components using the molding paste or wait and use gel medium to glue them down after the molding paste has dried. The above picture shows the images applied with molding paste. Now I am ready to apply acrylic paint to the background. First I lay in a light wash of color and let it dry before I begin adding additional layers of color, making sure not to completely cover the first layer because I want each layer to show through. While each background layer is drying I usually begin painting the collage elements using watercolor, acrylic, and inks. 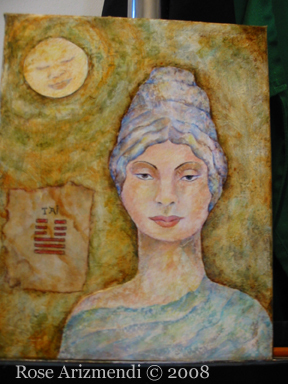 Below is a photo of the under painting and it is at this point I can make any necessary adjustments to Kuan Yin’s face and begin adding stamping, text and more collage elements. In this painting/collage I have added the I Ching hexagram Tai which means harmony, great powers, and the flow of good things. I was a busy little bee today. I started the morning with the ATC project I’ve been working on lately, then I moved on to an acrylic painting that has been waiting in the wings. Afterwards I finished up a watercolor painting and then cleaned up the mess I’d made in the studio. Whew!